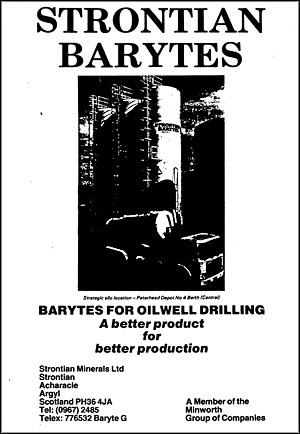 The group of mines known as the Strontian mines have been worked from the beginning of the 18th century and would probably of lapsed into obscurity but for a major re-working in the 1980’s which besides supplying barite for the North Sea oil drilling industry, has provided a supply of specimens onto the market and ‘re-invented’ the location for mineralogists. different from today. The quickest and safest means of access was by sea, there were virtually no roads into the hills, and the area was considered lawless and rebellious. 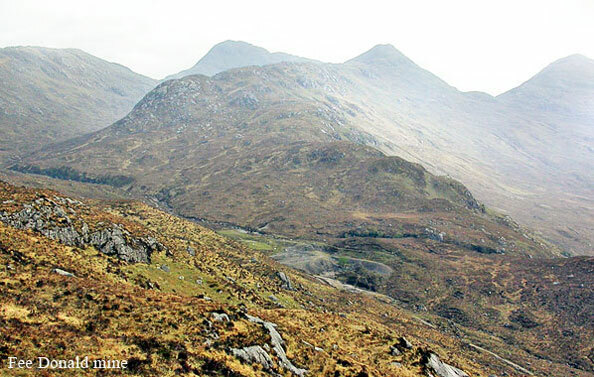 The Sunart Estate had recently come into the hands of Sir Alexander Murray, who set up residence at Mingary Castle and began a programme of improvements. 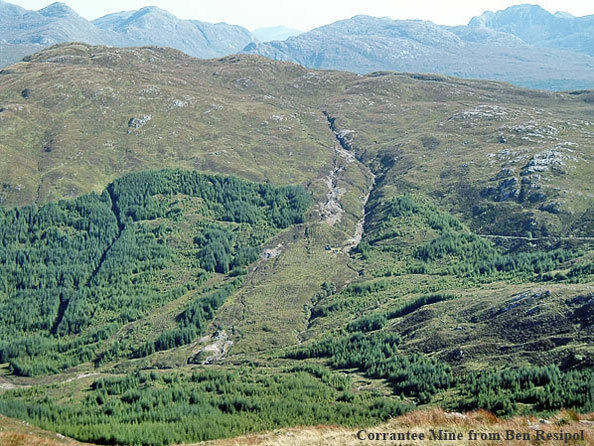 Lead was known to be found in the hills north of Strontian and Sir Alexander brought skilled miners from the south of Scotland to work the veins. independent groups who paid a fraction of the ore raised (usually an eighth) to the lord in tribute. It was not unusual for an annual income of a thousand pounds to be reported, so a considerable amount of ore must have been raised in this way. The first mine plans date from the turn of the eighteenth century and show a great deal of work had been done. Reports were commissioned on the state of the workings in 1828, but they paint contradictory pictures, one cautionary and the other enthusiastic. 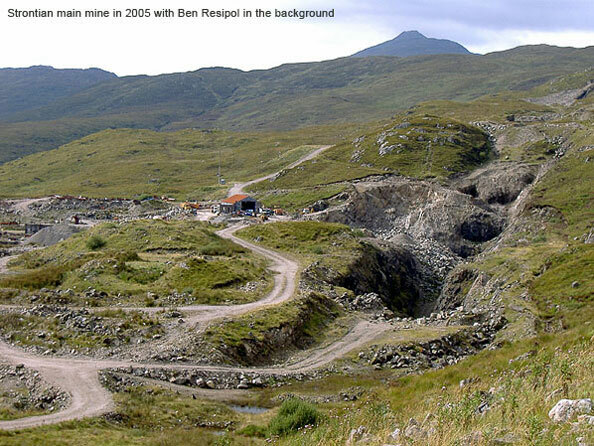 In 1846 the Strontian Mining Company took the lease, but they had given up by 1850. A succession of small companies followed, producing up to a few hundred tons of ore annually until the early 1870s when the price of lead crashed. An attempt to reopen Bellsgrove Mine which started 1901 failed before any ore was raised. 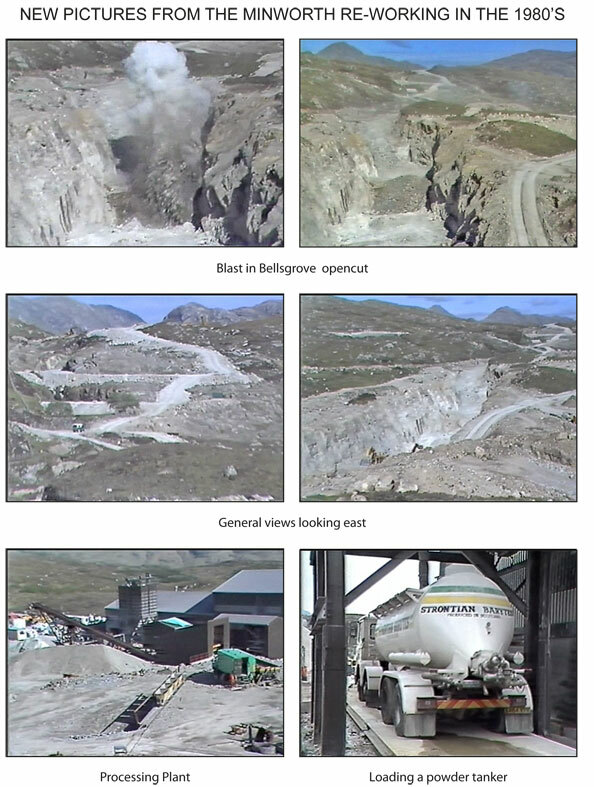 The barite lead and zinc mineralisation is associated with a shear zone which extends for over 2 kms, up to 15 metres wide and at least 300 metres deep. 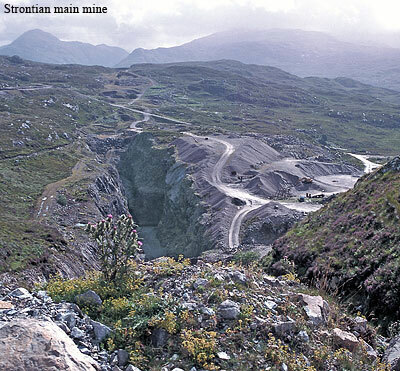 Old mine workings show the full extent of mineralisation to be 7kms laterally. 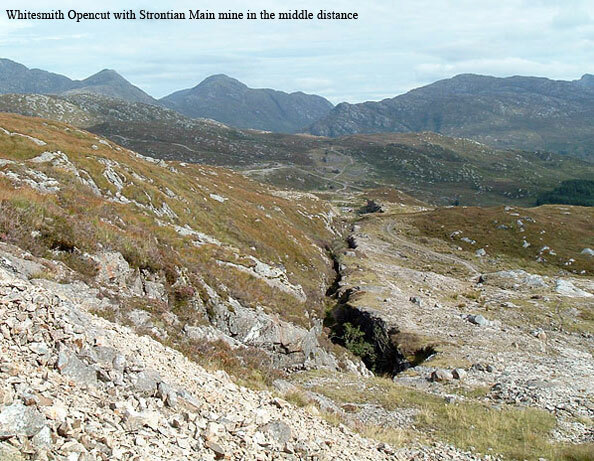 Strontian is the type-locality for Strontianite and Brewsterite. The strontianite occurs in sprays of white, green or brown crystals and is found mainly at Bellsgrove and Whitesmith mines. Brewsterite generally occurs in thin fissures often coating calcite and occasionally strontianite or harmotome with crystals generally to 4 to 5mm long up to a maximum of about 10mm. Calcite, harmotome; brewsterite; sphalerite; fluorite, pyrite; quartz; fluorite; galena. Calcite; galena; sphalerite; marcasite; harmotome; kainosite-Y; ancylite-Ce; hydrozincite. Harmotome; calcite; barite; pyrite; galena. Brewsterite; strontianite; galena; cerussite; heulandite-Sr; woodruffite; pyrite; calcite, ancylite-Ce.